It would be hard to find another book so tightly written and so purely conceived and executed as Jonah. In four brief chapters of a few simple verses each, a tale of unprecedented wonder is told with unadorned economy. Here is both the supernatural and the natural presented seamlessly together, in much the same way that the Saviour Himself is portrayed in the gospels. 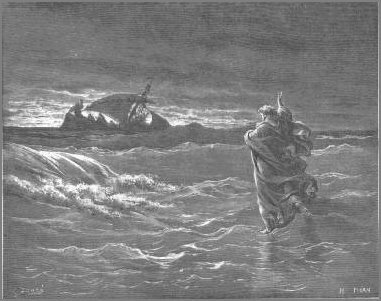 There is not even the blink of an eye in the transition between the very natural terrors of a raging storm and the supernatural wonder of a great fish that swallows up Jonah and keeps him alive for 3 days and nights, before vomiting him up onshore and unharmed. It is seamless. Christ’s life is the same. There is no demarcation line between Christ’s very practical and pithy peasant wisdom and the obviously divine authority with which it is unapologetically delivered. There is no quantifiable transition between Christ walking dusty roads like all the inhabitants of Palestine, and then walking on water as no human before or since ever did. There is no drum roll, no trumpet fanfare, no astonished aside by the writer of the gospel that warns us that something extraordinary is about to happen – and when it is over then things go back to unfolding the way we always expected them to – the way we are used to. In both instances, this is our God on display. He is intimately involved with His creation – especially with His creatures and particularly with those of His creatures whom He is bringing, and has brought, into His kingdom. Sometimes His hand is clearly visible as He suspends or alters, however fleetingly, the normal way His creation unfolds or is sustained. Most of the time His hand is hidden behind the so-called “natural” – but His hand is in all things whether seen or unseen. In those long spaces between overtly miraculous events His creatures walk by faith, believing God to be there – trusting when there is no direct line of sight – justified through, and living by, their faith, as Habakkuk said. I don’t go along with those who think of this book of Jonah as mere myth, and it is for the reasons already stated. God is a supernatural Being. If Jonah is a myth then why not Christ Himself? If the miracles in the book of Jonah are unbelievable then why not the miracles in the gospels? Where is the line to be drawn? When the Saviour of our souls speaks of Adam, Noah, Moses and the prophets (which include Jonah) and of Jonah himself as if they were literal, historical people, then how can mere man deny the genuine existence of any of them – or of the miraculous things that often accompanied their lives? By the same token we cannot – nor would we ever wish to – deny that Jesus Christ our God is the same yesterday and today and forever. I believe He does intervene and suspend the normal rules of existence with miracles right up until this very day. People are healed, supplies come in the midst of otherwise hopeless situations – a way is made where there was no way. But I believe He does so in a way consistent with what we read in the Bible. As in Jonah, as in the gospels and in Acts – so today, God interjects divine miracles into “normal” life according to His purposes. The life of faith is not, as some believe, the life of endless miracles – but the life that trusts God when there is no God to be seen by merely mortal means. When miracles become just another word for “sight” then we cease to be walking by faith. This is what makes the Word of Faith teachers so abominable. They take faith and twist it into something it is not in the Bible, and was never meant to be.